Italy has recalled its ambassador to Brazil amid an escalating row after the Brazilian government refused to extradite a convicted murderer. 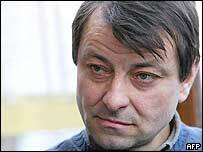 Cesare Battisti is a former member of an armed group involved in a series of killings in the 1970s. Brazilian officials suggested Battisti's life could be at risk if he returned home, a claim that has infuriated the authorities in Rome. Italy says its ambassador has been called back "for consultations". Battisti escaped from an Italian prison in 1981, while awaiting trial for his role in the murders of a police officer, a prison guard, a butcher and a jeweller. He was convicted in absentia by an Italian court and sentenced to life in prison. In the 1970s, he was a member of a militant group calling itself Armed Proletarians for Communism. He went to France where he spent many years working as a thriller writer. He has repeatedly denied any involvement in the killings. Two weeks ago he was granted political refugee status by Brazil. The Italians asked for him to be extradited, a request that was turned down. The Brazilians suggested that Battisti was a victim of political persecution. Recalling its ambassador for "consultations" is diplomatic language designed to mask the real extent of Italian anger, says the BBC's Duncan Kennedy in Rome. There have been calls by some politicians for a boycott of Brazilian goods and to cancel holidays there, our correspondent adds. Italian Foreign Minister Franco Frattini said: "Battisti is a terrorist, he assassinated innocent people, he has been condemned by the Italian court and so we do want to have him back in Rome." Mr Frattini said it was not acceptable for Brazil to treat Italy as a country where human rights are not respected. He added that all legal opportunities were being explored, including going before the Supreme Court of Brazil for a different decision. The Brazilian foreign ministry says Italy's recall "will not affect diplomatic ties", AFP news agency reported.